Did Andy Vajna use public funds to purchase TV2? Polish Prime Minister Mateusz Morawiecki and Hungarian Prime Minister Viktor Orbán held a joint press conference today at the Hungarian parliament following bilateral talks. Morawiecki became prime minister on December 11 following the resignation of Beata Szydlo. Previously he headed the ministries of finance and development, portfolios he continues to hold as prime minister. “Two countries met today that belong to the central European region,” said Orbán, who then proceeded to observe that today Central Europe was made up of “successful countries” and contributed far more to the strength of Europe than anyone would have thought at the time of European Union accession (in 2004). Europe’s fastest-growing region, the countries of Central Europe contributed to the continent’s economic stability, he claimed. “Neither one of us want to live from German money,” Orbán said, observing that the Visegrád 4 countries were experiencing the highest growth rates in the region. Turning to the question of migration, Orbán said the European Union’s immigration policy had failed. 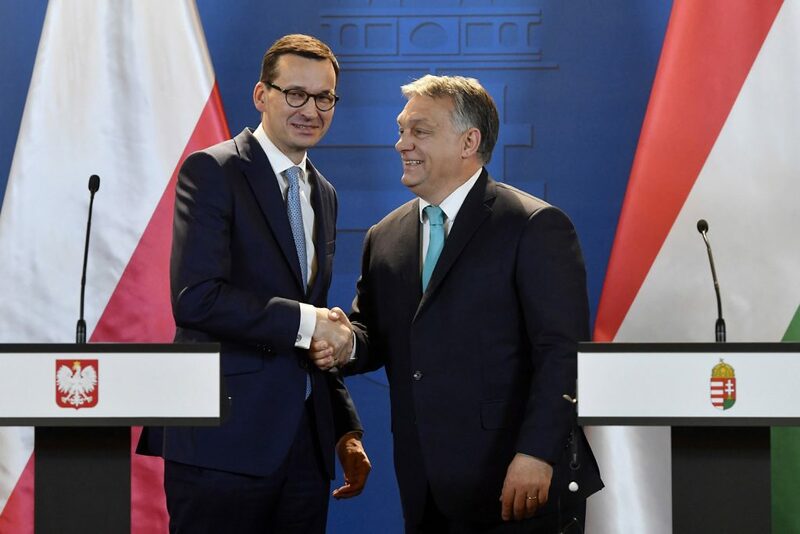 “Obviously, the peoples of Europe do not want immigration,” he asserted, adding that it was necessary to defend the borders and “rather than bring migrants here it is necessary to take assistance there.” Finally, he thanked the Poles for helping Hungary defend its borders. Orbán then spoke about the unity and joint actions of the V4. “We would like to make it clear that Central Europe is standing on its own legs,” he said, and the V4 countries of Poland, Slovakia, Hungary and the Czech Republic intended to express their opinion in the EU. The prime minister concluded his remarks by saying that “Polish-Hungarian friendship will remain one of the European cornerstones in the future as well.” He invited Morawiecki to say a few words about future bilateral cooperation on questions of north-south communications and gas lines. Morawiecki opened by saying he had first met Orbán in 1989 at the funeral of former Hungarian prime minister Imre Nagy when the latter talked about the need for the Soviet army to leave Hungary. The Polish prime minister then turned to the role of the V4 and Central Europe, saying the V4 did not question the unity of the European Union, and in fact this was something they wanted to build collectively. He said that over the course of bilateral talks with his Hungarian counterpart on issues pertaining to the energy industry and the EU’s next financial framework, Poland’s position was similar to that of the Hungarian government and this was something they would like to jointly represent. “Viktor spoke at length about the refugee crisis, and we completely agree with this position,” Morawiecki said. This had not changed in the past two years and “we have the right to decide who to admit and who not to admit.” He stressed that Poland was planning a role in the handling of the refugee crisis by, among other things, reducing the migration pressure from the east. Hungary would continue to take a hard line with Brussels on the obligatory settlement quota, on the creation of “an imperial center and centralized control” and on the “confusing of migration with immigration,” (whatever he meant by that-ed.). Morawiecki stressed that the Polish government had not changed its position on migration. “It appears the national states can decide whether they want immigrants or not,” he said, adding that it was necessary to help the immigrants in their own countries, in which he claimed Poland had played an active role for some time. The Polish prime minister spoke about connecting the two countries’ gas networks, the construction of the Norwegian gas line, and the creation of the new railway between Belgrade and Budapest, which he claimed would be “a project of strategic importance in ten years time,” without elaborating. Orbán said it was not possible to remain strong in the region without an economy that is nationally owned, and called on Europe to build its own defense force apart from NATO. Responding to questions from journalists about the handling of the refugee crisis, Morawiecki reiterated his position that the problem should be solved locally, and they were prepared to assist in this. He said more and more countries were coming around to this point of view, including Austria.